Information encoded by triplet nucleotides of DNA determines the order of incorporation of amino acids into proteins. We envisioned an alternative use of DNA as the scaffold for encoding information. We used DNA sequence as a program consisting of series of blocks of nine or more nucleotides. If we add desired functional proteins fused with DNA-binding domains that bind to those DNA blocks, the functional proteins spontaneously arrange along the DNA in a defined order, depending only on the program DNA sequence. This DNA-guided assembly platform provides particularly powerful tool for engineering biosynthetic pathways. We selected six different zinc fingers and determined their binding to their corresponding DNA target sequences using surface plasmon resonance, mobility shift analysis and β-galactosidase reporter assay. FRET effect was used to demonstrate simultaneous binding of four different zinc fingers with split fluorescent proteins to the program DNA in mammalian cells. The real world application of the DNA-guided biosynthesis was demonstrated on a violacein biosynthetic pathway consisting of five enzymes. In addition to violacein the native biosynthetic pathway produces large amount of a green side product deoxychromoviridans. In our designed biosynthetic pathway, however, this side product was absent. Furthermore, the yield of violacein production was 6-fold higher in the presence of DNA program coding for the linear order of enzymes in comparison to the scrambled DNA program. These results demonstrate that the correct order of enzymes in the biosynthetic assembly is important rather than just enzyme clustering. 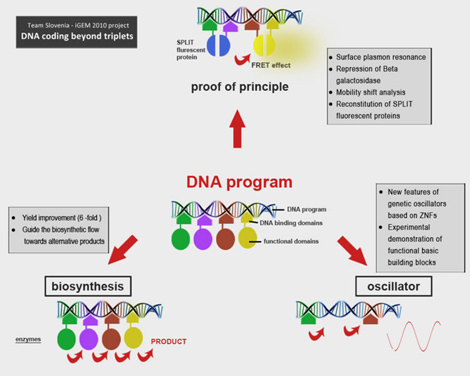 Artificial DNA-binding domains also have great potential for information processing and our modeling demonstrates the potentials for expanding repertoire and features of genetic oscillators. In conclusion, our project demonstrates novel application of DNA as the carrier of information in synthetic biology. With over 700 available characterized zinc fingers almost limitless number of combinations is on hand, providing a strong support for maturation of synthetic biology from craft towards the engineering science. We designed chimeric violacein biosynthetic enzymes with added zinc finger DNA binding domains. In the presence of correct DNA program the yield of violacein production improves 6 fold. We performed both deterministic and stochastic simulations of Smolen oscillator and repressilator comprising zinc finger based repressors using realistic kinetic parameters and Poisson-distributed time delay. In these models we demonstrated that this system exhibits oscillations only in topologies comprising odd number of repressor elements while the increased number increases the stability and extends the time constant of oscillator. We submitted 151 parts to the registry, which can be used for application of our DNA-guided platform for biosynthesis, building oscillators, characterizing DNA binding domains etc.